The rampant pace of technology change at retail is astonishing. The primary reason we are seeing so much innovation is because quite frankly retail has to evolve to stay relevant. 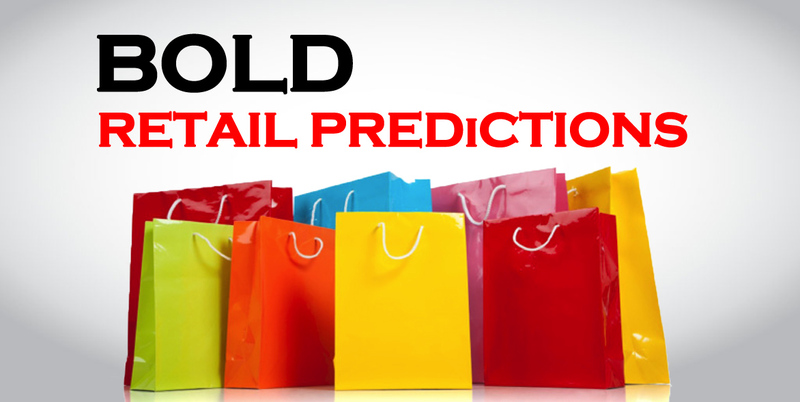 So while we are all busy implementing today’s challenges such as omni channel eCommerce and mobile we wanted to put our heads up above the clouds and make some bold predictions of some very likely things that could happen in retail over the next 10 years. We strongly believe there will be a retail revival and here are some threads as to why. With the likes of Adidas, Amazon, Apple, Bauer, Microsoft, Nike, Specialized and other major brands opening up their own retail storefronts and competing directly with their retail partners as “experience centers” it is just a matter of time that retailers start requesting their private label products also are sold there to reciprocate the relationship. Is this the beginning of a role reversal or blend of interests? Amazon has a real target on its back, and the company realizes this with its recent shift towards services including travel and doubling down on cloud hosting. The company is still in search of a sustainable business model. With retailers shifting towards omni channel eCommerce with in-store pickup click and collect programs and most recently ship from store Amazon’s investment into shipping and delivery is being dwarfed by retailers waking up to technology. I wouldn’t be surprised to see Amazon throw in the towel on selling products in its marketplace and purely shift to services. Drones will not be delivering products. As for other eTailers, some are opening physical brick and mortar locations to stay relevant once omni channel takes full effect such as Zappos. Product companies are smart. They see the advantages SaaS (Software as a Service) companies are offering where they obtain continuous monthly subscriptions to develop long-term relationships with clients. With Internet connected products such as Nest, Smart TV boxes, etc. what happens when these companies get acquired or the products or no longer serviced? There is a real opportunity for retailers to be the backbone of this industry and provide customers the confidence of continuity. Rather than being asked if you would like a retailers warranty on a product, imagine if you get asked if you would like the retailer to host your data in the cloud versus a brand? On retail operations mobile has a real opportunity to play including mobile POS, back end inventory lookup with indoor GPS to pinpoint product locations and more. But opportunities for customers coming into stores with mobiles will be severely hampered, other than mobile payments. Why? Because the retailer cannot control this experience and rather than getting buried in a screen customers are missing grander opportunities within the store itself. We talk about the smart home or connected home, the real opportunity is the smart store. I believe customers will eventually be so caught up in the retail experience they won’t want to take out their phones other than to take a picture. After all, we are already seeing a decline in show rooming and more of a move towards web rooming already. What is the shared economy? Remember Blockbuster video where you could rent something called a DVD? What is old will be new again except this time it will be the rental of products from retail. Customers will opt to rent higher quality items they do not anticipate using frequently and save money and much needed storage space in the meantime. In general, we probably will own less stuff. We are already starting to see this take shape. AirBnB had the most bookings last year and does not own any property, Uber is the world’s largest taxi company and does not own any taxis. With the adoption of omni channel eCommerce, it places more responsibility at the store level of employees. This push towards in-store pickup and ship from store will drive more local decision making authority and require someone who makes more than minimum wage to call the shots. Remember with Amazon disappearing there is going to be a whole whack of money on the table to those who empower employees and adopt enabling technologies. In particular as brands begin to open stores, these key staff members are the eyes and ears of the company to provide crucial feedback to create better customer experiences and products. In addition, we will see a new generation of independent omni channel retailers develop bringing small independents and local retail that has been proliferated by Amazon back into the mix. This headline might sound daunting, but it is true. With the shift towards in-store pickup, ship from store, and endless aisle technology it makes sense for retailers to carry more product in stores and shrink their store front square footage to accommodate. In fact many retailers including Best Buy are already piloting this format. Yes, we will lose some under performing stores or stores in close proximity to one another but the main driver is to increase same store sales so retailers can get more money out of their existing brick and mortar infrastructure. After all products belong in stores where they can be discovered and experienced, not warehouses…Right Amazon? Although we realize these things may not come true, they are predictions and possibilities.